The most efficient hole-cutting tool you'll ever use! The no-clog design makes hole-cutting quick and easy. Cut holes from 1/16" to 1/2" in diameter - with one tool. Extra-sharp blade edges cut through leather-hard clay cleanly, without excessive sanding to follow. Touch the tool point at the center of the hole to be cut. Add a slight pressure and twist to produce the perfect hole! Use the small end of the tapered handle to counter-sink and smooth hole edges. 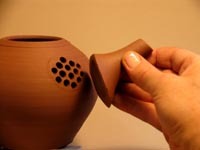 Cut hole patterns in colanders and sieves, garlic jars, potpourri pots, candle lamps, teapots and more..."